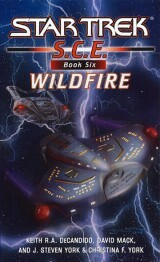 The da Vinci goes on a dangerous salvage mission: to rescue the U.S.S. Orion from a gas giant. As if the planet’s violent atmosphere wasn’t peril enough, the Orion carries the devastating Wildfire device — a warhead that can ignite gas giants into stars. But the operation might be more than even Capt. David Gold’s crack team of expert problem-solvers can handle.